Tat a motif inspired by World War I veteran Chester Ross Bentz Sr. tatted for his son. 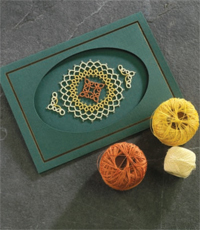 This kit includes 3 colors of high quality thread, instructions to tat a motif, and a tatting shuttle. If you've always wanted to learn how to tat, now is your chance. 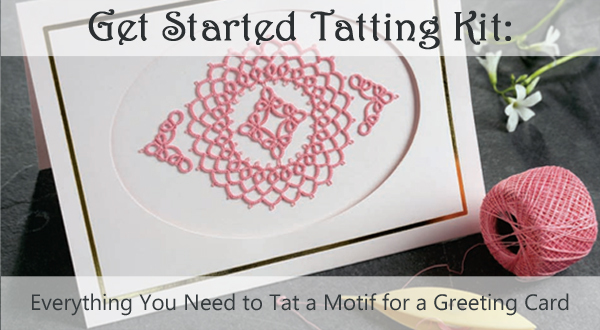 The popular craft of tatting is inexpensive to start, and we make it even easier for you. If you know the basics of tatting, this kit has all you need to tat a motif: a shuttle, thread, and instructions for a motif designed by Carolyn Wetzel. 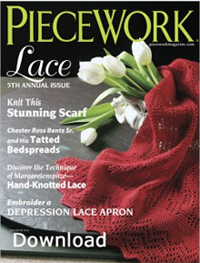 Lace—magical, often mysterious—is center stage once again in our fifth annual issue. Here are just a few of the intriguing people you’ll meet in this issue: Margarete Naumann, born in Germany in 1881, spent her life designing and promoting her remarkable hand-knotted lace that she named Margaretenspitze (Margarete’s lace); Sir Henry Borlase established a bobbin-lacemaking school for young girls in 1626 in Buckinghamshire, England; and World War I veteran Chester Ross Bentz, Sr. learned to tat at a Red Cross facility in Europe while awaiting transport back home after the Armistice. This motif is a replication of a motif found on Chester Ross Bentz Jr.'s tatted bedspread, which his father made for him in World War I. Read the story and step-by-step instructions for tatting this motif in the May/June 2012 issue of PieceWork. This motif can be adhered to a greeting card, framed, or attached to a ready-made garment. The exceptional high quality of cotton thread is ideal for tatters, crocheters, and even knitters. Lizbeth thread is a 6-cord cordonnet, shiny thread with rich color. The thread is super-combed and gas-singed for outstanding body. The colors are uniform throughout. This kit includes a ball of Lizbeth thread Size 80 in three pastels: #602 Natural, #621 Dusty Rose, and #689 Mint. Colors may vary slightly from what is seen here. Moonlit shuttles are made of plastic. Each is 2.375 inches long excluding the hook and .625 inches wide. This kit will include one shuttle in Grape Taffy (purple), Berry Smoothie (pink), or Gumdrop Green. Color may vary slightly from what is seen here. Thank you to our partner Handy Hands for supplying the thread and shuttles for this kit. Handy Hands has been in business since 1990 serving tatters. We have a limited supply of kits. Order yours today while supplies last!